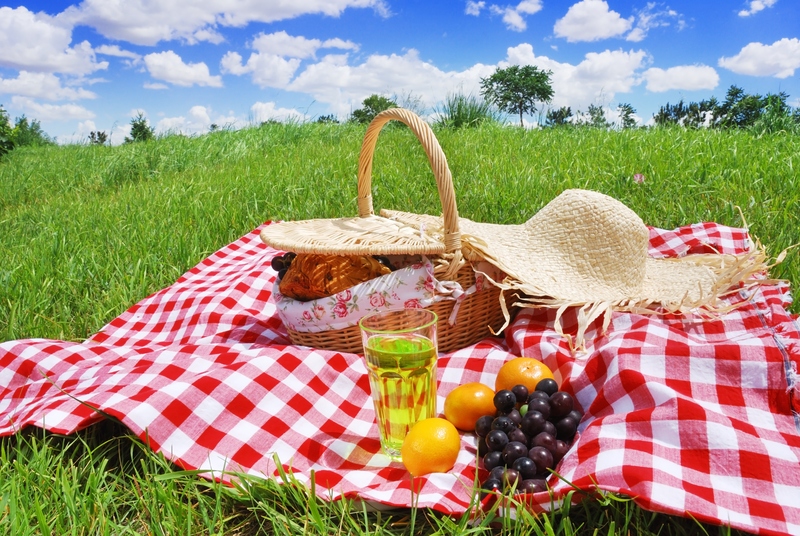 Summer is here and that means time for picnics and barbecues. This season is a great time to head outdoors with friends and family, but warm weather events can also present opportunities for foodborne bacteria to thrive. As summer temperatures heat up, so does the food, causing bacteria to multiply at a rapid pace. In order to protect yourself, your family and your friends during these warm weather months, safe food handling when eating outdoors is critical. Compass Urgent Care has put together some guidelines we found through the Centers for Disease Control (CDC) for transporting, preparing and serving food safely. 40°F or below to prevent bacterial growth. Meat, poultry, and seafood may be packed while still frozen so that they stay colder longer. Keep coolers closed. Once at the picnic site, limit the number of times the cooler is opened as much as you can. This helps to keep the contents cold longer. This might be a good time to explain to kids that only adults will manage the cooler. Don’t cross-contaminate.Be sure to keep raw meat, poultry, and seafood securely wrapped. This keeps their juices from contaminating prepared/cooked foods or foods that will be eaten raw, such as fruits and vegetables. Clean your produce.Rinse fresh fruits and vegetables under running tap water before packing them in the cooler – including those with skins and rinds that are not eaten. Rub firm-skinned fruits and vegetables under running tap water or scrub with a clean vegetable brush while rinsing with running tap water. Dry fruits and vegetables with a clean cloth towel or paper towel. Note: Packaged fruits and vegetables that are labeled “ready-to-eat,” “washed,” or “triple washed” need not be washed. Outdoor Hand Cleaning:If you don’t have access to running water, simply use a water jug, some soap, and paper towels. Or, consider using moist disposable towelettes for cleaning your hands. Utensils and Serving Dishes:Concentrate on keeping all utensils and platters clean when preparing food. Marinate safely.Marinate foods in the refrigerator – never on the kitchen counter or outdoors. In addition, if you plan to use some of the marinade as a sauce on the cooked food, reserve a portion separately before adding the raw meat, poultry, or seafood. Don’t reuse marinade. Cook immediately after “partial cooking.”If you partially cook food to reduce grilling time, do so immediately before the food goes on the hot grill. Cook food thoroughly.When it’s time to cook the food, have your food thermometer ready. Always use it to be sure your food is cooked thoroughly. 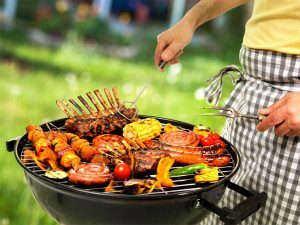 Keep “ready” food hot.Grilled food can be kept hot until served by moving it to the side of the grill rack, just away from the coals. This keeps it hot but prevents overcooking. Check for foreign objects in food.If you clean your grill using a bristle brush, check to make sure that no detached bristles have made their way into grilled food.